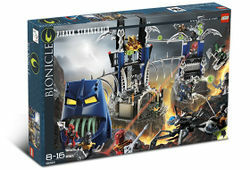 8894 Piraka Stronghold is a BIONICLE Playset released in 2006. It contains the Piraka Stronghold and twelve minifigures: Nuparu, Matoro, Hahli, Hewkii, Jaller, Kongu, Hakann, Vezok, Zaktan, Avak, Thok and Reidak. This is a description taken from LEGO.com. Please do not modify it. (see an archive of the product's page) Seize the Stronghold! The evil Piraka have built a massive stronghold in the center of Voya Nui. Here they produce their zamor spheres and hatch plans to steal the Mask of Life. But now, the Toa Inika have arrived and the battle for Voya Nui has begun! Zamor spheres fly as the Toa battle Piraka and a Fenrakk Spawn Spider in this deluxe battle set. Who will win this all-out battle? Includes 6 mini Toa Inika and 6 mini Piraka figures. All-new mini Toa and Piraka have cool masks & moving parts! Includes special light brick and magnifying glass for laser effect! Giant Piraka mask features huge fangs! Includes 6 green and 2 blue zamor spheres! Send zamor spheres down the track to the tower launcher! Also during the commercial, the narrator stated the stronghold was alive. This set was designed by Torben Skov. Facts about "8894 Piraka Stronghold"
This page was last edited on 9 February 2019, at 23:30.